LSU starts off the season as the #2 team in Baseball America’s national top 25 (behind National Champ Vandy), and the perennial contender knows as well as anybody how to show it off. This is LSU’s second “S.I.O.” and you can check out their 2014 feature (which has more of the facilities) at this link. I want to sincerely thank Spencer at LSU for putting this together for us. Follow LSU Equipment on Twitter for more looks as the season progresses and beyond. Nike is customizing the MVP Pro 2/MVP Elite 2 silhouette for its top schools this season, and LSU gets one of the best treatments we’ve seen. A few fresh customs from Wilson. Some really nice work from the guys on these. They customized theirs at WilsonCustomGloves.com. This is the part of the feature when your feelings of awe turn to jealousy. Don’t worry, its perfectly normal. LSU is lapping just about everybody in the Swag Department and there’s not much you can do about it. DeMarini Voodoo Overlord FT – Customizable at DemariniCustomBats.com. Some miscellaneous items here… Opening Day in the clubhouse (which happens to be today 2.13.15). The bat knob decals are from Pro Helmet Decals. Sick Nike jersey. In that last photo of the door decal, I don’t even know what purpose those plaques on the left actually serve but I need them. Nobody does it better than the Purple and Gold. 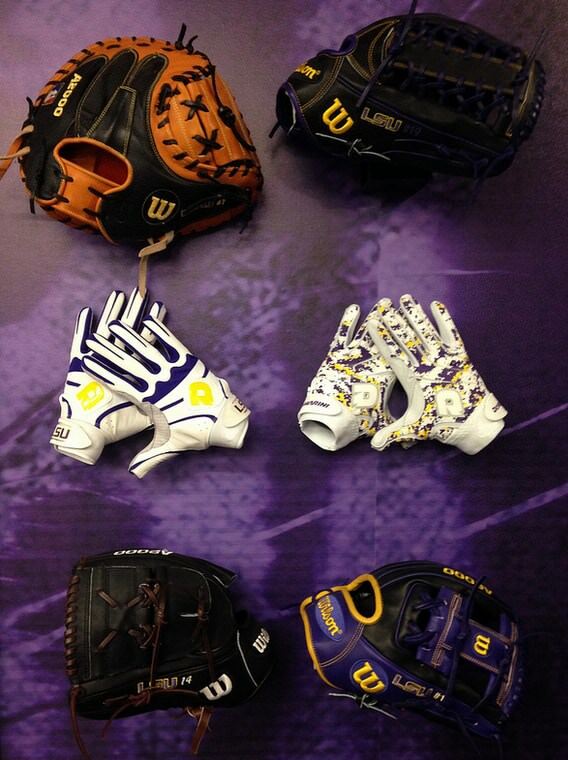 Check out last year’s “Show It Off” for some more photos and don’t forget to follow @LSUBaseballEQ for more LSU gear.